SINGAPORE: Consumers in the region can look forward to faster Internet connections in the next five years, with a new submarine cable system launched on Tuesday (Oct 18). Super Sea Cable Networks (SEAX)’s system is aimed at wholesale carriers for emerging markets who want to own cable systems but do not wish to operate them themselves, according to a press statement by the Singapore-based company. The countries targeted are Indonesia, Malaysia, Thailand, Cambodia, Philippines, Bangladesh, Vietnam and Myanmar, it added. This expands Singapore’s submarine cable infrastructure further, after a consortium consisting of Singtel, China Mobile International, China Telecom Global, Global Transit, Google and KDDI started service for a new trans-Pacific submarine cable system in June. Local telco Singtel also announced plans to build a submarine cable linking Singapore and Perth by 2018 earlier this year. SEAX said its submarine cable project will be divided into three phases from 2016 to 2021. The first phase will connect Singapore, Malaysia and Indonesia, drawing internet traffic from the region towards Singapore and then transmitting out to the rest of the world, especially the US and Europe. The second phase will connect Singapore to the US through Guam, a US territory in the Pacific region of Micronesia. The firm said this will link the Southeast Asian region directly to the US through a path away from the earthquake-prone and heavy shipping traffic zones of the South China Sea. The final phase of the project will connect Asian countries such as Bangladesh, Myanmar, Thailand, Malaysia and Indonesia, which will potentially act as an alternative path from these countries using Singapore as a transit hub to the rest of the world, SEAX added. “With SEAX’s submarine cable system network, we believe we could be able to draw transit traffic from the Middle East as well as to the region and to provide them a reach into the emerging markets,” the company said in the press release. Speaking at the launch of the first phase of the network on Tuesday, Speaker of Parliament Halimah Yacob said broadband access was necessary for people to benefit from economic opportunities and stay connected with each other in the modern world . Citing a United Nations Environment Programme report that 95 per cent of international communications were routed via submarine fibre-optic cables, Mdm Halimah said data and voice transfer through these cables was both cheaper and faster than through satellites. “The introduction of submarine cables into isolated and third-world country locations has reduced the cost of communication access and stimulated increased economic growth,” the Member of Parliament for the Marsiling Yew-Tee Group Representation Constituency said. 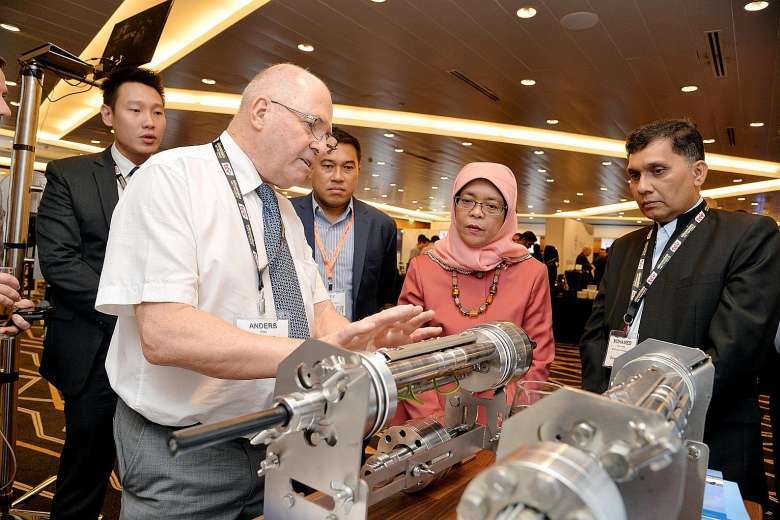 Mdm Halimah said the first phase of the submarine cable system will create a “paradigm shift” in the telecommunications industry and “generate an unparalleled amount of submarine cable connectivity” within the Southeast Asian region. This will ultimately enhance bilateral and multilateral cooperation amongst neighbours and strengthen the bonds between both the governments and peoples of these countries, she added.